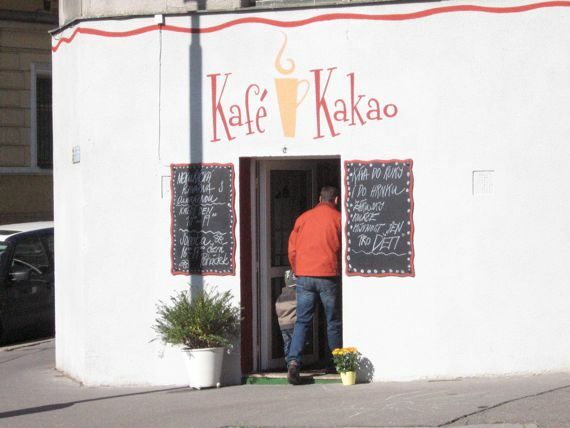 Prague 5 families have their Cirkus Cafe and now families that live on the other side of the river are just as spoilt with the newly opened Kafe Kakao for kids. Our KIP team happened to come across this venue by chance as the owners were setting up, so we were keen to come back and try it for ourselves once they were officially open for business. Location wise the cafe is close to two very nice playgrounds: Hlavickovy Sady and Bezrucovy Sady, so you can make a nice morning or afternoon outing by combining the cafe with one of the playgrounds. It’s also walking distance from Namesti Miru so it’s easily reached from other areas. The cafe is a few steps down a staircase which isn’t too difficult to navigate and there is plenty of room for prams at the bottom of the stairs. Inside you will find two rooms, the main room which contains seating and beyond that is a smaller room with the play area and a further 4 to 5 tables. Especially nice is the aspect, the windows all face South so there is plenty of light and sun filtering in. The play area had Lucie completely occupied and I actually had trouble leaving (she really didn’t want to go!). 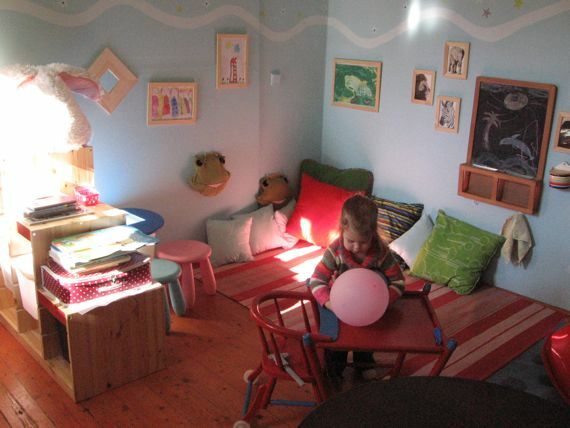 There is a mini kitchen, cars, puzzles, books, drawing materials, a train set and plenty of toys for all ages. 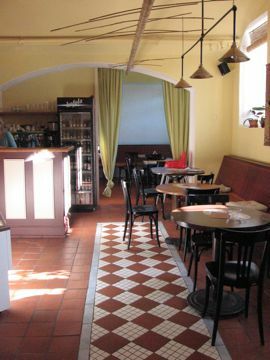 The venue is non-smoking and offers a range of drinks including Puro free trade coffee, delicious cakes and savory meals. I was ravenous so decided to try one of their tortillas with mozzarella, pesto, fresh basil and rucola accompanied by tomato and cucumbers in a balsamic dressing. It was very tasty and the ingredients very fresh, I could have eaten another easily but restrained myself. Lucie had a waffle with chocolate sauce (a special treat) and an apple juice all served in colourful kids cups, bowls and cutlery. 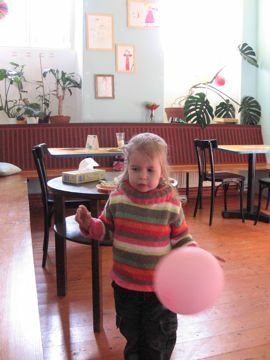 Kafe Kakao currently have fairy tale readings on Saturday afternoons from 4 till 6pm and they also plan to have interactive theatre for kids each Monday from 4-6pm, interactive meaning that kids get involved with the performance as much as possible. They also do take away coffees which is worth knowing if you’re heading to one of the above mentioned parks and need to kick start your day.